Last week I had a super-interesting time as a guest of the International Centre of Graphic Arts in Ljubljana, Slovenia, to do a keynote talk and discussion on one day, and to run a workshop the next, in a two-day symposium on cultural institutions and digital media. By ‘cultural institutions’ we mean museums, galleries, libraries, and arts organisations; and we were considering how new technologies can help such institutions to engage people. I figured that we didn’t just want to talk about digital media in isolation – and that they didn’t just want my version of ‘hints and tips’ about how to use YouTube and Twitter – not least of all because I’d be talking with an enterprising bunch of professionals who would already have their own experiments and expertises in that area. So in my talk I proposed ten – count ’em! – ten arguments about how cultural institutions can seek to reach new people, and serve a valuable social role, as platforms for creativity, using a mix of digital media and hands-on physical events and things. → Media you make, and institutions, and events, as triggers for experiences and making things happen (see recent blog post on making meaningful connections). 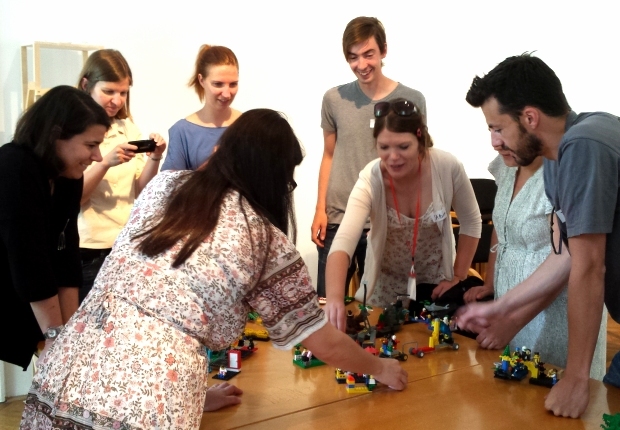 The workshop, using LEGO Serious Play principles – which I continue to refine – went especially well, reaching a climax when all the participants combined their individual models into a pleasingly meaningful collaborative model. I really like the idea of museums and libraries as platforms for creativity (which builds on ‘Making is Connecting‘ and lots of things you’ll find on this website). If you represent such a place and want to develop these ideas with us, do get in touch.